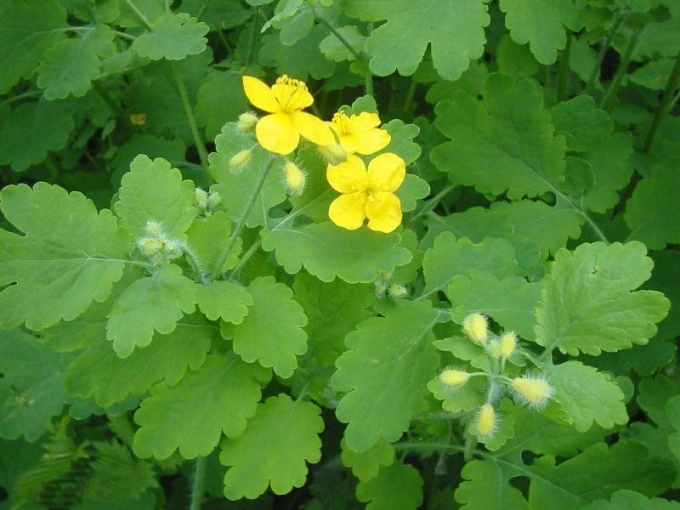 Celandine has long been very popular in folk medicine, it can be used both topically and inside. This plant often show warts on the body, used as bactericide, healing and anti-inflammatory medication. For the treatment of various diseases using juice and oil of celandine, also on the basis of this plant make ointments, tinctures, decoctions. Collect celandine during flowering in dry weather. Therefore, the plant will dry faster and the probability of the decay can be excluded. Select only those flowers that grow in the shade, because in dark places they are more fed with useful medicinal properties. Determine the right place to gather this herb. It should grow in the wild places remote from the track, cities, industrial zones, garbage dumps. During harvest, always follow precautions. Put gloves on your hands and a gauze bandage on the face before you start collecting celandine. These measures are necessary due to the fact that the plant is very poisonous, and the pollen can cause allergies and irritation. If you cut the plant with his bare hands, then don't touch their face and do not RUB the eye. Pry the Bush out of the ground together with the root. Please note that the plant was not damaged. The leaves should be a rich green color, with no trace of fungal and other diseases. Collect celandine in the basket, fabric bag or bucket, try not to break and not to crush the plant. Thoroughly rinse the stem and roots, then divide the infusion into few bundles and hang to dry in a well ventilated and dark place, the ideal option may be an attic or covered from the light spot on the balcony. The better conditions will be created for quick drying, the more juice and minerals stored in the plant. In the case of slow drying increases the likelihood of spoilage of raw materials. After the grass is dry, gather it into a bundle and wrap in paper. The root system close, top leave ajar. Celandine can be kept in boxes or other containers for several years, as long as the room was dry, dark, and it is well ventilated. The harvest suggest to carry out in the period from late may to July. The people still suggest doing it when the moon is waxing and in the morning. During this period, all plants have a maximum useful properties. Depending on what you want to use celandine after drying, it is possible to eradicate or peeling only the tip of the plant. Sometimes harvested separately only the juice of celandine. One liter of pure juice add half a liter of vodka, in this form it can be stored in the refrigerator for up to 3 months.